This blog post was originally posted by Chargify in 2011. We have updated it to include PCI changes in 2015. “PCI” is a term that’s coming up more and more as banks and credit card processors get more serious about credit card data security. We completed our first PCI Level 1 audit in 2011. Here are some things we learned that may help you achieve compliance for your business. Sorry this post got so long, but it’s worth reading and it’s a lot shorter than trying to figure all of this out from scratch! For the sake of brevity, I’ll refer to the organization and their various standards simply as “PCI” in this post. Everyone who accepts credit cards must be compliant with PCI data security standards. But the process of validating your company’s compliance varies widely, from easy to hard, depending on your type & size of business. If you’d like to read the actual PCI-DSS specifications, they are available here (you’ll see a list of documents… click on the newest one that’s named “PCI DSS”… for instance, as of May, 2015, the newest one is called “PCI DSS v3.1″… unlike in years past, you now must do a click-through agreement before you can get the actual document… otherwise, we would have just linked to it directly). Any entity that handles credit card data and/or provides card processing services on behalf of other merchants. This is the part that required Chargify to go straight to Level 1 even in our very early years. Fewer than 20,000 Visa or MasterCard transactions per year. If you’re Level 3 or 4, then you can do your own Self-Assessment of compliance. No auditors. But as of 2015, there is a new wrinkle. Surmountable, but a wrinkle. Please see below. If you fall into Level 1 or Level 2, you should expect a fair amount of work to pass your audit. The audits do get easier in subsequent years, simply because you’re more prepared. Back in 2011, it took Chargify and our parent company, Grasshopper, nine months to get through our first Level 1 full audit. Subsequent years have been much better, especially because we have a great ops team! The PCI people are not trying to shut down small merchants, but they do want you to figure out if you meet the PCI-DSS security requirements, and they really don’t want card data in more hands than absolutely necessary. If you’re a small/medium business and you rely on someone like Chargify for all of your credit card data-handling operations, then your life is a lot easier. You can self-assess. While Chargify does support some very large businesses today, most of our merchants are small in the eyes of PCI. PCI has developed a set of Self-Assessment Questionnaires that can be used by Level 3 and Level 4 merchants. These questionnaires are referred to as “SAQs”. 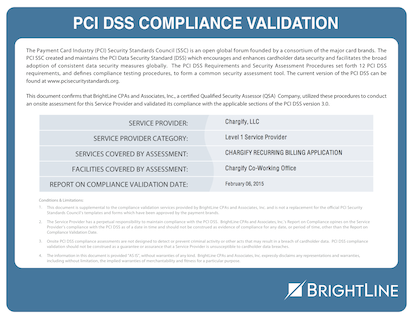 They help you figure out if you’re compliant with the PCI-DSS standards. This is the proper questionnaire for merchants who use Chargify-hosted pages for all collection and updating of consumer’ card data. You can use our consumer signup pages, card update pages, and consumer self-service Portal. This questionnaire is pretty hard to fulfill. It covers a lot of things that most of our merchants won’t have any control over, especially if they use cloud-based services for hosting and other functions. Many companies are out of compliance here. They are doing what they think is okay (and was okay until 2010). They’re using an SSL-secure web page to collect and display credit card data, and they’re transmitting that data to their payment gateway or to Chargify via API calls. Unless you want to pay for an annual PCI audit, this path stopped being a reasonable path years ago. Part 1a is your business info. Pretty easy. Part 1b is your “assessor” info. This only applies if you need to hire an outside PCI company to asses your progress on fixing items of non-compliance. You should not need an assessor if you pass the first set of questions in Section 2b (basic eligibility questions). If you get through Section 2b (basic eligibility) okay, then you’re “compliant” and you don’t need to fill out Section 4. Of course, if you didn’t pass Section 2b, then you’ve got a bit more work ahead on Section 4. Section 3 is easy stuff, like your signature. Section 4 is your “Action Plan for Non-Compliant Status” and contains a lot of questions, plus other sections after it that you’ll have to fill out. When you’re done, you’re supposed to submit your completed SAQ to your “acquirer”, which is the the bank where you have your credit card “merchant account”. This is not your regular checking account. It’s the special “merchant account” that you got so you can process credit cards. Sometimes it comes bundled with your credit card payment gateway. If you don’t know where to send your completed SAQ form, try to contact whoever got you your payment gateway or merchant account, or a reseller who may have sold you both. Sometimes, your merchant account provider will ask for your SAQ, so it will be clear who needs it. For details regarding the Visa PCI Level criteria & validation requirements, please look here. For details regarding the MasterCard PCI Level criteria & validation requirements, please look here. For details regarding the American Express PCI Level criteria & validation requirements, please look here.